At the Fresh Farm we dedicate a lot of time to customer feedback. Recently our lovely veggie customers have been requesting a vegetarian potato dish… Well your wish is our command! 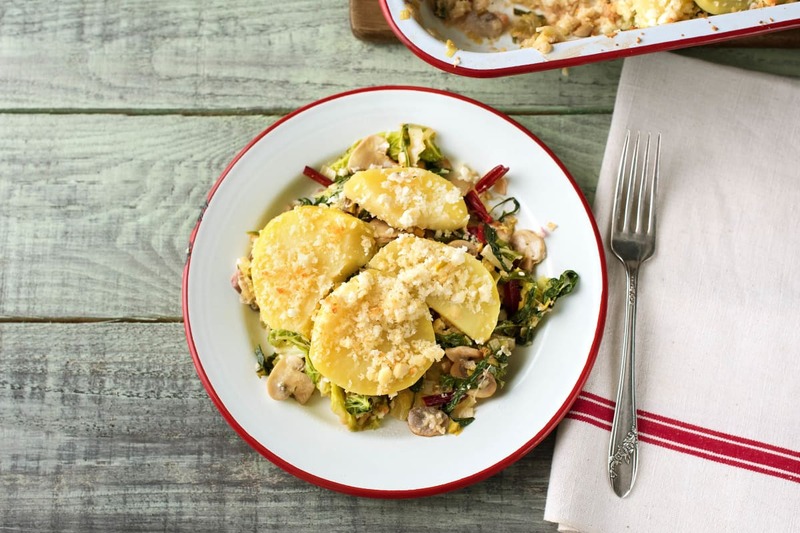 This delicious, creamy and comforting dinner is full of vegetables and topped with some crunchy breadcrumbs and feta… yum! Put a large pot of water on to boil with a good pinch of salt and pre-heat your oven to 220 degrees. Peel and slice the potato into 1cm wide slices. Cut the bottom root and the green leafy top off the leek, cut in half lengthways, then slice into ½cm wide slices. Cut the celery lengthways into 1cm wide strips then chop into 1cm cubes. Slice the mushrooms and pull the thyme leaves off their stalks and discard the stalks. Once the water is boiling, add your potato and cook for 10 mins or until your potato is soft. 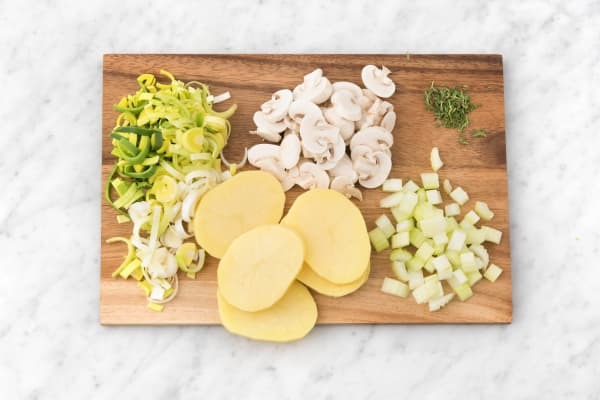 Tip: The potato is cooked when you can easily slip a knife through, but be careful because you don’t want the potato slices to break up too much. Once cooked, carefully drain your potato slices in a colander. While your potato is cooking, put a large frying pan on medium heat and add a splash of oil. Throw in your leek and celery. Cook for 5 mins, then add your mushrooms and thyme leaves along with a pinch of salt and a grind of black pepper. Cook for another 7 mins. 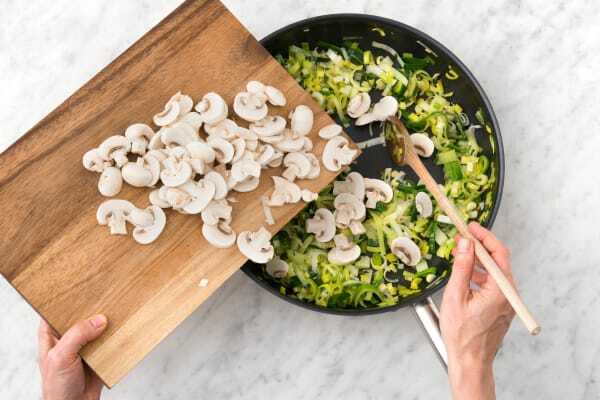 Once your mushrooms have softened and slightly browned, and your veggies are cooked, pour in the water (amount specified in the ingredient list). Add the vegetable stock pot, bring to the boil and stir to dissolve, then add the cream. Simmer for 3-5 mins, then add the rainbow chard and kale. 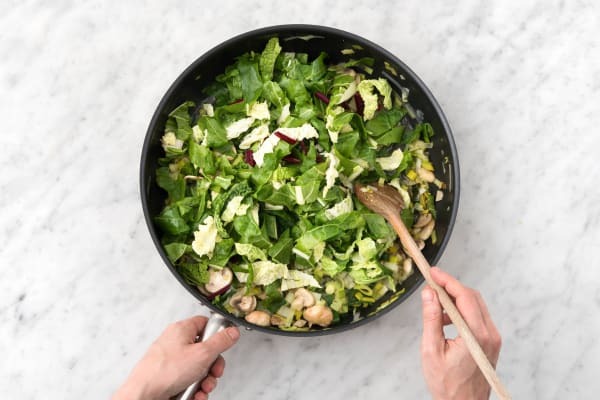 Gently stir into your veggie mixture so that the leaves wilt. Then turn the heat to low, bring to a gentle simmer for another 5 mins until your veggie mixture has reduced by a third. Take the pan off the heat. While your veggie mixture is cooking, put the panko breadcrumbs with a splash of oil in a bowl. Crumble in the feta and mix everything together. Once cooked, pour your veggie mixture into an ovenproof baking dish. 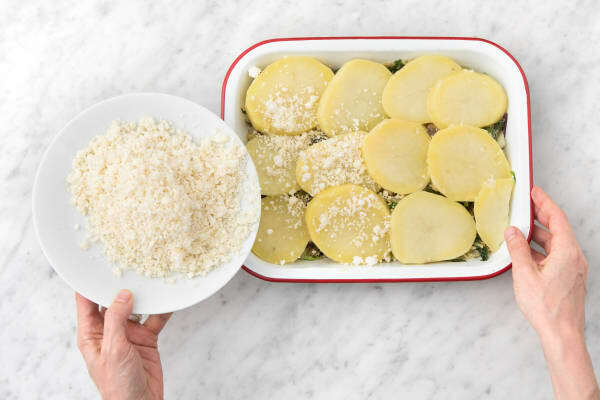 Lay your potato slices on top, then sprinkle over the feta crumb. Season with black pepper and pop onto the top shelf of your oven to cook for 10 mins (or until the top is browned). While your pie is cooking, get your washing up done! Once your pie is cooked, remove it from your oven and serve in bowls. Voila!